In the City of Lights, two star-crossed lovers battle a fate that is destined to tear them apart again and again for eternity. When Kate Mercier's parents die in a tragic car accident, she leaves her life--and memories--behind to live with her grandparents in Paris. For Kate, the only way to survive her pain is escaping into the world of books and Parisian art. Until she meets Vincent. Mysterious, charming, and devastatingly handsome, Vincent threatens to melt the ice around Kate's guarded heart with just his smile. As she begins to fall in love with Vincent, Kate discovers that he's a revenant--an undead being whose fate forces him to sacrifice himself over and over again to save the lives of others. Vincent and those like him are bound in a centuries-old war against a group of evil revenants who exist only to murder and betray. Kate soon realizes that if she follows her heart, she may never be safe again. In this incandescent debut, newcomer Amy Plum has created a powerful paranormal mythology with immortal revenants. 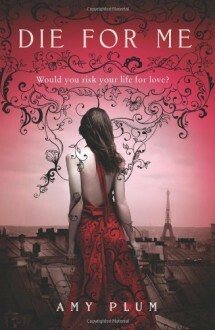 The Paris setting comes enchantingly alive as a relentless struggle between good and evil takes place in its streets. Rich with romance, atmosphere, and thrills, Die for Me will leave readers breathlessly awaiting its sequel.